Are You Having iPhone 3G Connection Problems? The day after I bought my iPhone 3G I went back to the local Rogers store to see how things were going, and a customer was there complaining that he couldn't get on the 3G network. The customer service rep tried fiddling with his iPhone, but the settings all looked right. Yet there I was, less than 5 feet away, with full, fast 3G speed downloading TiPb's homepage at that very moment. Later that night, I saw some chatter that others thought Rogers was down because they couldn't connect either. How a device performs in individual situations depends on circumstances like where you are in the 3G coverage, how close you are to a cell site. Things like terrain and buildings all come into play. I'm not denying that people are having a less than satisfactory experience, but overall, the phone is doing great. 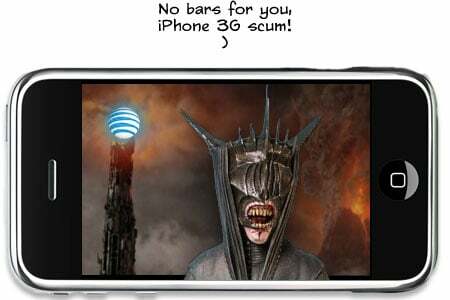 GigaOm, however, picks up some analyst rumors about potentially flakey 3G chipsets, while iLounge steps it up with T-Mobile and Vodafone laying blame on the same, with the Syndney Morning Herald claiming an unnamed source revealed that Apple only provided 3G test units to carriers the day before launch. Ouch. Any chip experts out there that could help identify what problem would cause reception problems for a fraction of users? Mine, like I said, is rock-solid so far, only dropping to EDGE in areas where Rogers' coverage is weak to begin with. How about you? Any 3G connection problems?